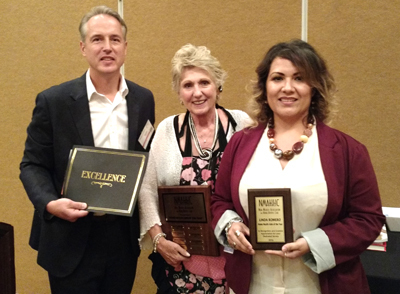 Linda Miranda Romero, CAN, HHA with J&J Home Care Inc., was selected to receive the Joie Award for Home Health Aide of the Year during the Aug. 4 meeting of the New Mexico Association for Home and Hospice Care (NMAHHC). Several awards were presented during a dinner luncheon for outstanding home and hospice care workers and volunteers from throughout the state, with Romero taking the award named for NMAHHC Executive Director Joie Glenn. Roimero has been employed by J&J Home Care for nine years as a home health aide and has been a certified nursing assistant since 2007. J&J says Romero is in constant touch with the primary nurses and/or therapists regarding the care of her patients and gives exemplary direct care and encouragement to her patients, which aides in the patients’ outcomes and in meeting the plan of care goals. Romero was born in Chihuahua, Mexico, came to New Mexico as a resident at the age of 15, learned English, and graduated from Lake Arthur High School in 2000. She became a naturalized U.S. citizen in 2010. She is a single mother raising two young daughters.